Stony Hill Road Bridge over Big Beaver Creek in Eden Township reopened ahead of schedule in May 2017. The 200th bridge in Pennsylvania’s Rapid Bridge Replacement (RBR) Project was completed this month. 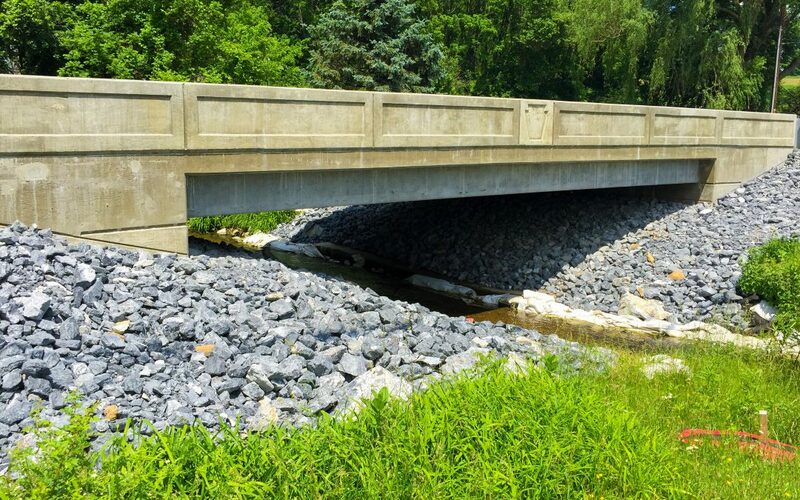 The Public-Private Partnership (P3) between the Pennsylvania Department of Transportation (PennDOT) and Plenary Walsh Keystone Partners began in mid-2015 as an effort to jumpstart the massive endeavor of decreasing the number of structurally deficient bridges in the commonwealth. The contractor group is comprised of ARTBA members Plenary Group, Walsh Construction Co., Granite Construction Inc. and HDR, and has been working with Pennsylvania-based subcontractors, many of whom are also ARTBA members. The group was awarded a nearly $900 million contract to replace 558 bridges within 36 months. Construction crews are replacing aging bridges with structures that are designed to last over 100 years. The 200th bridge replacement was on Route 414 in Franklin Township, in the state’s southeast corner. The bridges in this project are primarily crossings on smaller state highways, many in rural areas, rather than interstate bridges or large river crossings that typically take much longer to repair or replace, and cost much more. ARTBA analysis of the National Bridge Inventory reveals that about three fifths of identified work nationwide is expected to cost under $1 million, while another 15 percent should range from $1 million to $5 million per project. Pennsylvania topped the list of the most structurally deficient bridges in the nation in 2013 and 2014, but has moved down the list to No. 2 in both 2015 and 2016 due in part to the RBR Project. To see more on the project and the bridges that are slated to be replaced, visit www.parapidbridges.com.